The idea of a quiet, serene, reserved art gallery opening is familiar to all of us. But when you introduce fully functional, custom motorcycles into the exhibit—their motor oil dripping onto red shop rags below—and invite their leather-clad admirers, the normal gallery vibe is out the door. 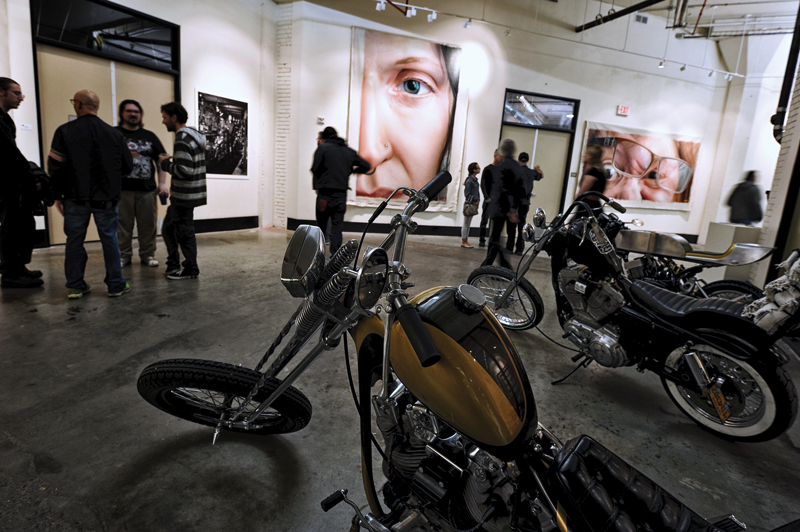 On April 4, the Go Big Or… exhibit opened in the Ford District at galleryHOMELAND inside the Ford Building, bringing an already atypical gallery experience to an even grander scale with enormous paintings, several motorcycles, and photographs from large-format cameras. 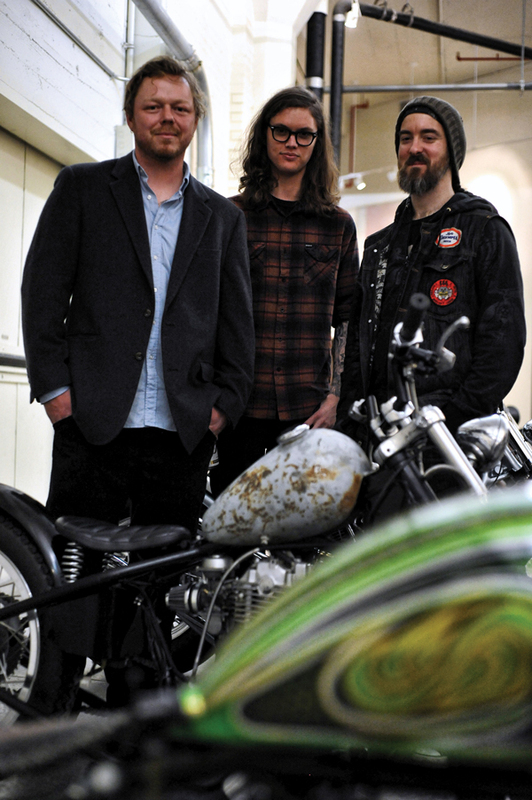 Left to right: Jason Coatney, Jordan Conway and Tony Morgan amidst Morgan’s motorcycle exhibit. Portland photographer Jordan Conway, who shoots with a large format camera, documents alternative culture. The exhibit features his works that are fueled by isolated, human-influenced landscapes and custom motorcycle culture. Left to right: Miri Stebivka and Jason Coatney with Coatney’s painting of Stebivka. 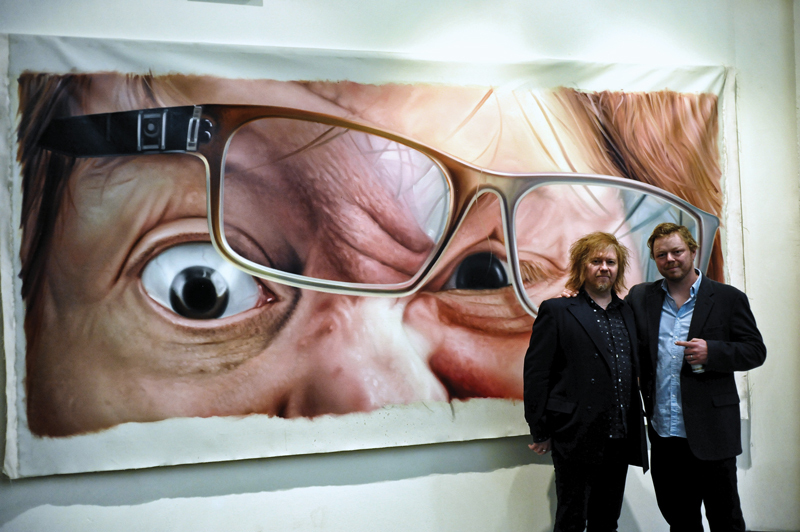 Jason Coatney’s paintings are not only very large, but feature subjects’ faces at a shocking scale. Readers might recognize some of the subjects in these works. Coatney collaborated with galleryHOMELAND and Portland artists for this exhibit, some of whom have been featured in this magazine. Working out of Brooklyn, Coatney used photographs of artists taken by Miri Stebivka in the Foster-Powell neighborhood to produce his large-format paintings. The results are breathtaking. 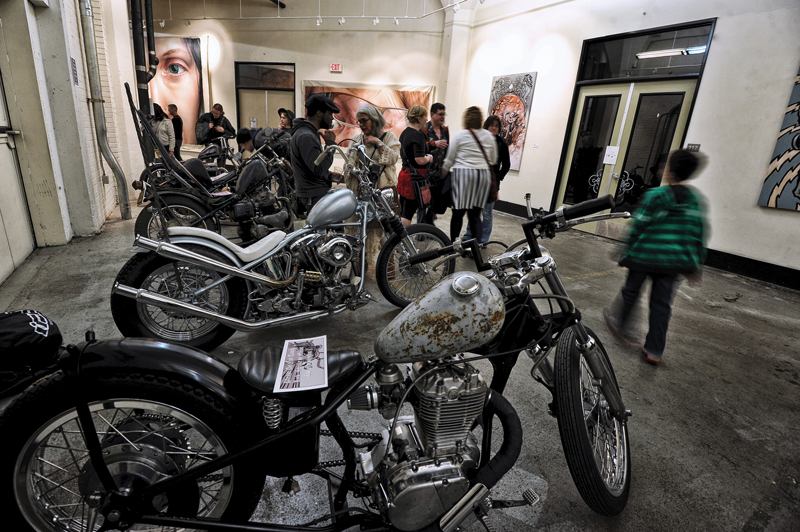 A view of the exhibit with Tony Morgan’s motorcycles. In the background are Coatney’s paintings and one of Morgan’s paintings to the right of the frame. 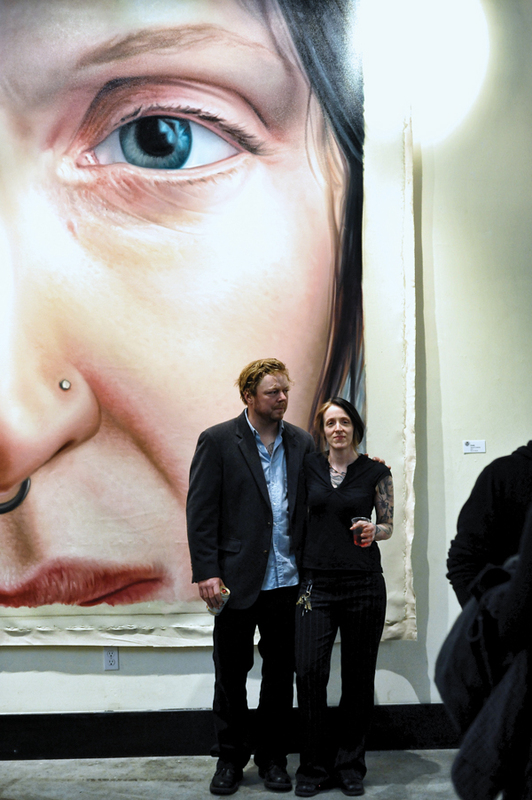 Left to right: Painter Jason Coatney with artist Emily Kosta in front of Coatney’s painting of Kosta. A view of the exhibit with Morgan’s motorcycles. In the background are Coatney’s paintings and one of Jordan Conway’s photographs, this one featuring Morgan in his shop, to the left of the frame. 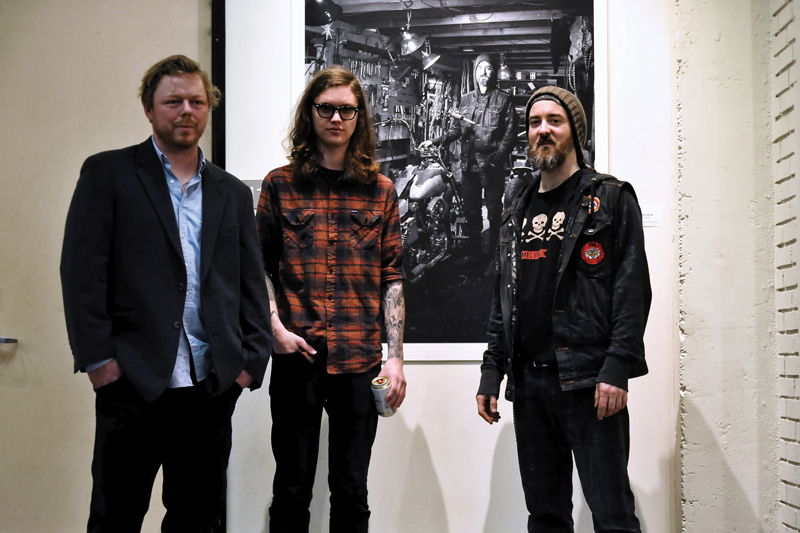 Left to right: Jason Coatney, Jordan Conway and Tony Morgan with one of Conway’s photographs. 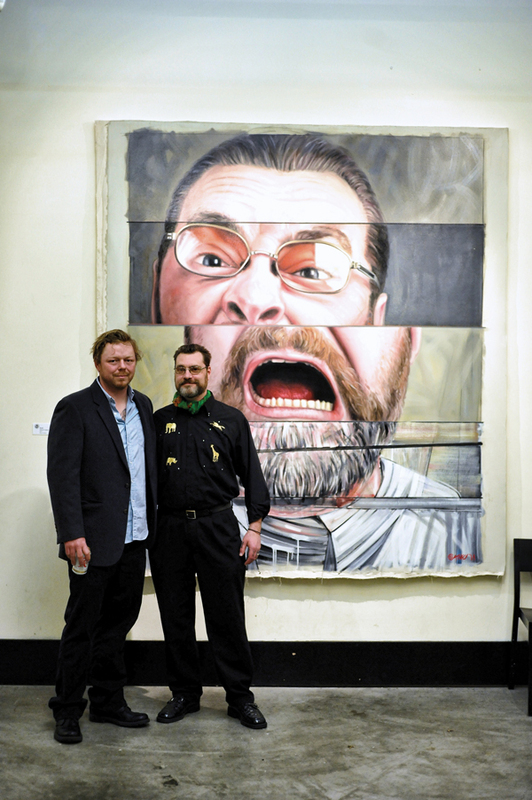 Left to right: Painter Jason Coatney with artist Zack Kosta in front of Coatney’s painting of Kosta.